One of the pleasures of living in the woods and in this particular geographic area (Southwest Georgia) is seeing quite a number of wild animals. Not too long ago, a rather large white-oak runner snake (also known as a gray rat snake) was in the road that comes up to my home. Bobby, who does a lot of work at the sanctuary, saw him, grabbed the camera, and here he (or she) is. They are not poisonous; they are constrictors, are good climbers, and are plentiful around here. I either chase them or move them out of our barns on a regular basis. A couple of days ago, I got a real scare from probably the same snake (judging by his size) because I thought he was a rattlesnake. 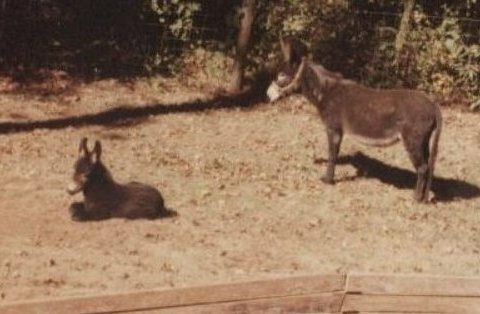 He was close to the house, inside the pasture of the main barn. I was in the barn, tending to evening chores, but the dogs’ barking was insistent. As I got close, in the dusky darkness, I saw a coiled snake with a patterned back, and he was rattling. I thought, “Oh, my goodness, I have here a large rattlesnake.” Neither the snake nor the dogs were happy, not to mention me. I was very grateful that the snake and the dogs were on opposite sides of the fence. I immediately got the three dogs inside the house, then went back out with a flashlight. The snake had uncoiled, was going on his way, and I could see he was a white-oak runner. Now, what you may not know about the white-oak runner is that when he’s cornered, he will bluff and act like a rattlesnake, as do several other snake species. Just a couple of days ago, I found a white-oak runner and an eastern kingsnake, also a constrictor, completely intertwined and motionless in Grover’s (pot-bellied pig) room in the main barn. It was disconcerting to me and I didn’t know what to do, so I just left. Later, when I went back, the white-oak runner was gone, and the kingsnake seemed to be asleep. I chased him out of the barn and took this picture of him. In an effort to understand what I had seen, I contacted Lora L. Smith, Ph.D., associate scientist in herpetology, at the Joseph W. Jones Ecological Research Center at Ichauway, here in Baker County. In sending her this picture of the kingsnake, I asked her if the kingsnake could have eaten a snake that appeared to me to be as large or larger than he is. She said, “I have no doubt that what you witnessed was an eastern kingsnake eating a white-oak runner! Kingsnakes can definitely eat snakes even longer than they are—including venomous snakes.” Wow! I know that nature’s way, but, oh, me. My stomach feels queasy just writing this. There are 41 snake species native to Georgia, six of them venomous, and all six inhabit Baker County. The eastern diamondback rattlesnake is the largest venomous snake and the most dangerous in North America. That said, this species is actually highly averse to human contact and only attacks in defense. Most bites occur when humans taunt or try to capture or kill them. The copperhead, cottonmouth/water moccasin (a water snake), canebrake/timber rattlesnake, pigmy rattlesnake/ground rattler, along with the eastern diamondback rattlesnake, are all pit vipers. Pit vipers have a special organ (pit) located between each eye and nostril that senses the body heat from animals. The sixth poisonous snake we have is the eastern coral, in the same family as the cobra and mamba. They are extremely reclusive and rarely bite humans. It is rather difficult to be bitten by them as they must literally chew on their victims to inject their venom fully. Their venom is highly neurotoxic. Besides the two pictured above, some other non-venomous snakes living in our area are the black swamp snake, coachwhip, black racer, brown snake, corn snake, eastern hognose snake, mud snake, pine snake, eastern garter snake, banded water snake, ringneck snake, scarlet kingsnake, brown water snake, eastern ribbon snake. Another harmless snake is the eastern indigo, a large, black snake, listed as a federally threatened species in Georgia. The eastern indigo is the largest snake in North America. Along with the many frogs, toads, lizards, and turtles in the area, until the extended drought, we always saw alligators in our large cypress pond and once in a while closer to the house, probably traveling from one pond to another. This gopher tortoise is sitting on the “apron” of his burrow. We call one of our hay fields the gopher field for all the gopher tortoise burrows in it. We are very proud of this because the gopher tortoise is listed in Georgia as a threatened species. One of the oldest living species native to Georgia, the gopher tortoise was designated as Georgia’s State Reptile in 1989. When the gopher tortoises excavate these burrows, they not only provide shelters for themselves but for many, many other animals, such as the indigo snake, pine snake, small mammals, burrowing owls, eastern diamondback rattlesnake, gopher frogs, to name a few. The burrows can be up to 40 feet in length and 10 feet in depth. 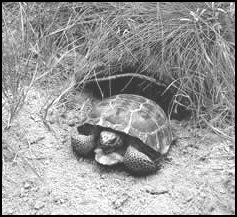 It takes up to 18 years for the male gopher tortoise to reach sexual maturity and the female up to 21 years. 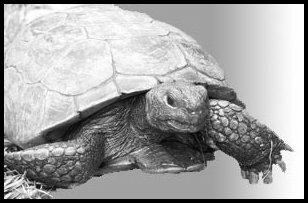 The website of the Gopher Tortoise Council in Gainesville, Florida, is a good place to visit. Their work involves the protection of the gopher tortoise, eastern indigo snake, kingsnake, and other species of Southwest Georgia. This gopher tortoise lives here at Amberwood Sanctuary. 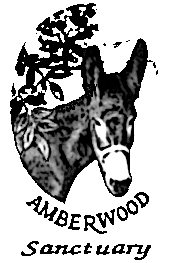 We are having an extremely hot and dry pre-summer—many days over 100 degrees, but the donkeys (being from the desert) don’t seem to mind too much as long as there’s plenty of water to drink. And they have lots of woods for shade, as well as the barns. Here’s a hint I came across for Easier Removal of Ticks: Apply a glob of liquid soap to a cotton ball. Cover the tick with the cotton ball and swab for 15-20 seconds. The tick should release his bite and be stuck to the cotton ball.